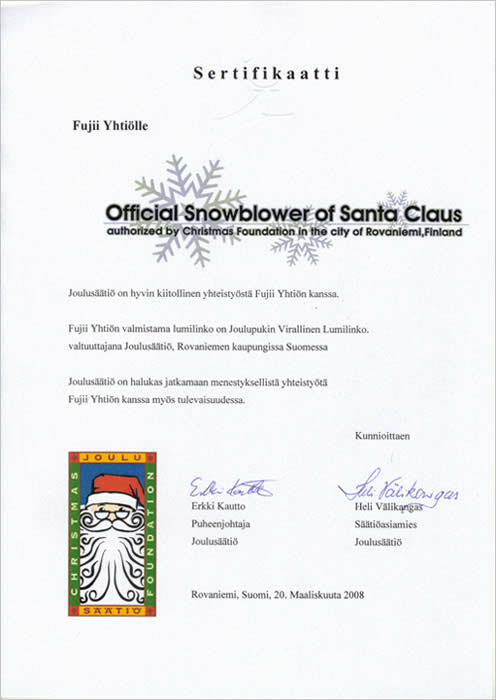 A certificate of the Official Snowblower of Santa Claus has arrived! 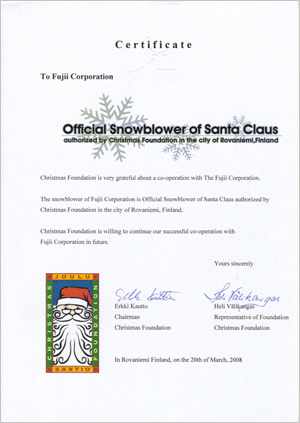 Fujii Corporation's snowblower is authorized as an official snowblower of Santa Claus and used in Santa Claus Village, Rovaniemi, Finland. A certificate was issued to prove this. This certificate was exhibited at the G8 Labor Ministers Meeting from May 11 to 13, 2008 together with a Fujii's snowblower.The exhibition was open to the public after the Meeting from May 14 to 18, 2008. Click here to go to the the Santa Claus Office website. Click here to go to the Rovaniemi (Santa Claus Village) website.